Character Classmates: Which ‘Game of Thrones’ protagonist should be in your study group? Last Wednesday, I, along with a group of students from Anne Twitty’s and Paul Polgar’s classes about the history of race in America, attended a special program that explored the experiences of enslaved people at Rowan Oak. The program, which included a tour of the site, a discussion about the erasure of enslaved people’s narratives and an overnight stay in an original structure, was conducted by the Slave Dwelling Project. The Slave Dwelling Project is a national program that brings a voice to enslaved people. The program gives tours of more than 125 sites where slaves used to live, including one on the grounds of Rowan Oak. Photo by Liam Nieman. Led by Joseph McGill, the Slave Dwelling Project is centered around bringing a voice to those silenced by history: enslaved people. McGill has conducted overnight stays and discussions at over 125 sites in more than 23 states. Though Rowan Oak is popularly known as the home of famed Oxford writer William Faulkner, it was also the townhome of Robert Sheegog, a slaveholder and early settler of Oxford. Sheegog was tied to the university’s early growth and he leased some of the people he owned to the university during its construction. The evening began with a tour of Rowan Oak’s grounds led by Carolyn Freiwald, an anthropology professor at the University of Mississippi who has participated in archaeological digs on the property. For a long time, Freiwald said, it was uncertain whether or not the brick structure directly behind the “big house” was original to the grounds. 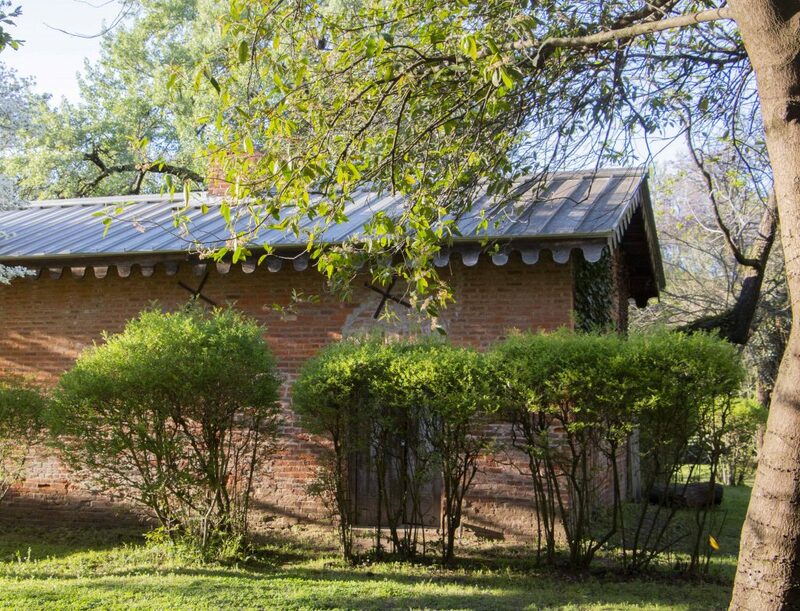 However, architectural experts recently deemed the brick structure was built around the 1850s and was likely used as slave quarters when Sheegog owned the property. Following the tour and a quick dinner of pork barbeque and the best potato salad I’ve ever had, McGill led a discussion regarding his broader project and the general history of enslaved individuals in the South. The project, he explained, has led him to many states, with his most memorable experience being his stay at Seward Plantation in Brenham, Texas. He had the opportunity to stand on an authentic auction block, which he said made the history real to him. He has stayed at numerous presidential sites, including the homes of James K. Polk, Thomas Jefferson, James Madison and Andrew Jackson. He will soon stay overnight at George Washington’s Mount Vernon. One of McGill’s main tasks — and challenges — is reversing the revisionist narrative developed by the United Daughters of the Confederacy following the Civil War. He, and everyone present at Rowan Oak last Wednesday, agreed that challenging the “Lost Cause” ideology is immensely difficult to grapple with as an academic and public historian. Several community members, including employees of the William Winter Institute for Racial Reconciliation, also discussed their work in Oxford to try and talk about the history that has been ignored so long — most notably, the town’s history of lynching. A local tour guide, Rhondalyn Peairs, described the resistance she faced from white Oxonians when trying to place a memorial plaque downtown that acknowledged lynching victims. But these efforts, Peairs said, aren’t about making white people “uncomfortable” but about paying reparations for dehumanizing black people and claiming them as property. McGill said that at every property, there’s one thing he looks for: fingerprints on the bricks. Because the South was literally built by enslaved laborers, the best way to make the “stolen labor” tangible is by examining the bricks. Sometimes, undried bricks would get stuck in the brick mold, which would cause enslaved individuals to remove the bricks by pushing them out by hand. This resulted in fingerprints drying onto the bricks. McGill said they are like voices calling out to us from long ago.